With every new innovation in the world of robotics, it feels as though they become a little less uncanny, and the idea of society being overthrown by murderous androids feels more and more remote. At least it did - until we saw the horrifying video of a robotic snake climbing up a ladder. Created by Kyoto University and the University of Electro-Communications, the clambering robotic reptile was unveiled at the 2018 International Conference on Intelligent Robots and Systems in Madrid. Although the snake's jerky movements look a little scary, the way it loops itself around each rung and quickly scales the ladder could have real-life applications - and even save lives. The team behind the pioneering robot has envisioned using it to access areas that humans cannot - particularly useful in disaster situations where buildings have collapsed - perhaps even seeking out survivors and assessing safe ways for emergency services to enter. 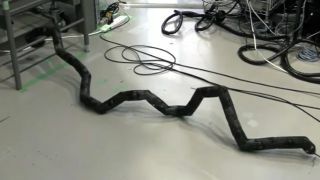 This isn't the first time a snake has been used as inspiration in the robotics world - in 2016 a robotic sea snake was developed by Norwegian companies Kongsberg Maritime and Statoil, as well as the Norwegian University of Science and Technology, with a mind to inspect and clean underwater infrastructure. Whether the ladder-climbing robot will become a common way of responding to disasters remains to be seen, but what's clear is that 'Snakes and Ladders' will never be the same.